TRIDEX is an antimicrobial hand wash containing Triclosan 0.3%. TRIDEX is formulated to combine the efficacy of Triclosan 0.3% in preventing nosocomial infection and its mildness on the skin as a hand soap. The floral fragrance and skin-protective moisturizer help to promote user compliance with repeated hand washing. TRIDEX is recommended for use in places where the aim is to prevent the spread of infection, including subacute hospital wards, nursing homes, clinics, schools, day care centres, dental clinics, laboratories, food preparation facilities and veterinaries. It is available in a 500ml bottle and a dispenser that controls wastage by releasing only 1ml of solution with every pump and preventing subsequent spout drip. A holder is available for mounting the bottle and dispenser on the wall. SKU: HUN 00 00 08. Category: STERIL Solutions. 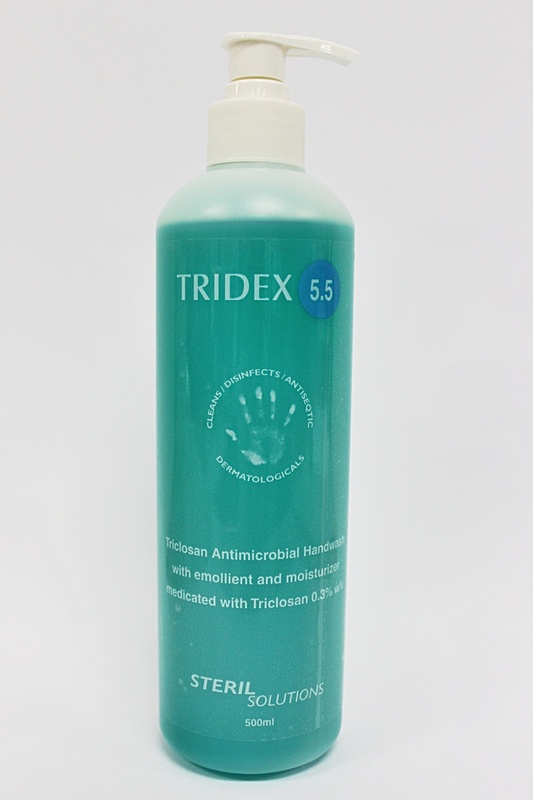 TRIDEX is an antimicrobial hand wash containing Triclosan 0.3%. TRIDEX is formulated to combine the efficacy of Triclosan 0.3% in preventing nosocomial infection and its mildness on the skin as a hand soap. The floral fragrance and skin-protective moisturizer helps to promote user compliance with repeated hand washing. Copyright © STERIL Medical 1988-2019. All Rights Reserved.